On Tuesday, October 9, at 8 PM Central, Leslie Albrecht Huber, will present, Jumping Over Hurdles in German Research, which will help you conquer common dilemmas such as record access, language, and immigration. To attend this webinar, register at https://www3.gotomeeting.com/register/309951654. Last week's webinar, Grandma did What!? : Researching your Famous and Infamous Relatives, presented by Gena Philibert-Ortega, is now available to ISGS members in the Members Section of the ISGS website (http://ilgensoc.org/members.php). Join us TONIGHT for the Share A Memory Workshop Webinar. 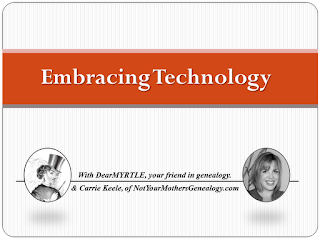 Starting at 9pm Eastern Ol' Myrt here and my daughter Carrie Keele, of Not Your Mother's Genealogy Blog will share ideas, including some contributed to our contest by viewers like you. 10 Dec 2012 starting at 9pm ET. OK, ready to branch out beyond the limits of your desktop computer? We'll explore how to manage and share our research from documents, photos and family stories, using new and emerging technologies. 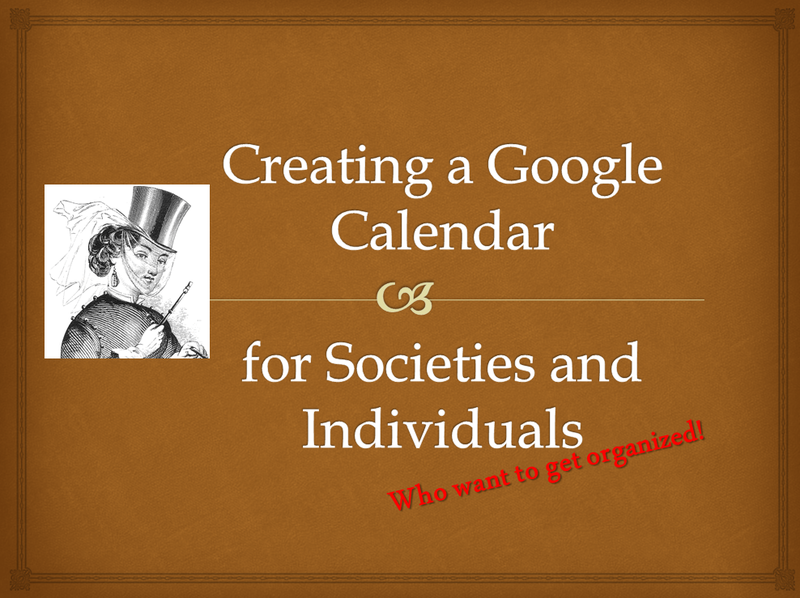 Friday, Septermber 14, 2012 beginning at 9:30am Eastern US Daylight, Ol'Myrt will present a "short subject" DearMYRTLE Workshop Webinar "Creating a Google Calendar: for Societies and Individuals who want to get organized!" 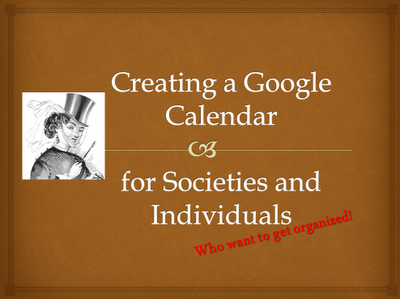 This webinar is specifically for Ol' Myrt's DearREADER Kathy of the James County, Tennessee Historical Society who wishes to set up a "regional" calendar spotlighting all genealogy and historical society presentations, workshops, classes, lectures and tours in her immediate area of Chattanooga. She is two hours from Nashville, Atlanta, Knoxville, Birmingham and other towns, and realizes many events come and go and people don't know about them. All DearMYRTLE Workshop Webinars(c) feature a little bit of PowerPoint and a lot of demos. The recording of today's webinar, What is a Reasonbly Exhaustive Search?, by Michael Hait, is now available to view for a limited time. Michael answered the question of, "how many sources do you really need for an ancestor?" and did a terrific job of explaining the Genealogical Proof Standard. If you could not make it to the live event or just want to watch it again, the 1 hour 30 minute recording of What is a Reasonably Exhaustive Search? is now available to view in our webinar archives. Visit www.LegacyFamilyTree.com/webinars.asp to watch. It will be available until September 24, 2012 for free. Own your own copy of What is a Reasonbly Exhaustive Search? by purchasing the webinar-on-CD for just $9.95. It includes the complete 1 hour 30 minute recording of the class, the question/answer session, and 2 pages of handouts. Click here for more information or to purchase. Michael Hait's new book, Online State Resources for Genealogy is also now available for just $15.99. The special discount coupon of search that was announced during the webinar is valid for 10% off anything in our online store through Monday, September 17, 2012. Forget that the term "genealogy" scares people away. Forget that you are thought of as the "genealogy nut" among your extended family members. It's time to share memories. This webinar demos creative ways to share what you've learned about ancestors. Join us as Pennsylvania genealogist and Quaker records expert Kay Haviland Freilich and Ann Wetherill Upton, Librarian of Quaker Special Collections at Haverford College present a webinar designed to help you discover your Quaker ancestors. Vital events. Wedding guests. Migrations. Lifestyles. Family groups. Patriotism. Quaker records offer researchers a treasure trove of information about ancestors. Knowledge of the record-keeping practices of the Society of Friends, what they recorded, and why, will help today’s researchers unlock all these facts and many more. Finding Pennsylvania Quaker records seems to be as challenging as finding Quaker ancestors; however, this presentation will show how the search can be straightforward and much easier. Participants will learn the tools and strategies for identifying which records will give them the information they need. Finding the location of those records and how to gain access to them, remotely and in person, will also be clearly explained. The exciting future of research in Quaker records will also be discussed as easy and reliable retrieval is in sight. The recording of today's webinar, Beyond the Arrival Date: Extracting More from Passenger Lists, by Lisa Alzo, is now available to view for a limited time. Lisa taught, "finding one record is not the end. It is usually a springboard to another record or document." She taught how to find other clues in passenger lists and recommended that we take a second look at the documents we've already discovered. We are likely to find something new that didn't seem important to us at the time of discovery. She also provided numerous websites, articles, and books to help us in our quest for our immigrant ancestors. Well done Lisa Alzo! If you could not make it to the live event or just want to watch it again, the 1 hour 30 minute recording of Beyond the Arrival Date: Extracting More from Passenger Lists is now available to view in our webinar archives. Visit www.LegacyFamilyTree.com/webinars.asp to watch. It will be available until September 17, 2012 for free. Own your own copy of Building a Family from Circumstantial Evidence by purchasing the webinar-on-CD for just $9.95. It includes the complete 1 hour 30 minute recording of the class, the question/answer session, and 4 pages of handouts. Click here for more information or to purchase. For a list of all of Lisa's webinar CDs, click here. The special discount coupon of immigrant that was announced during the webinar is valid for 10% off anything in our online store through Monday, September 10, 2012.